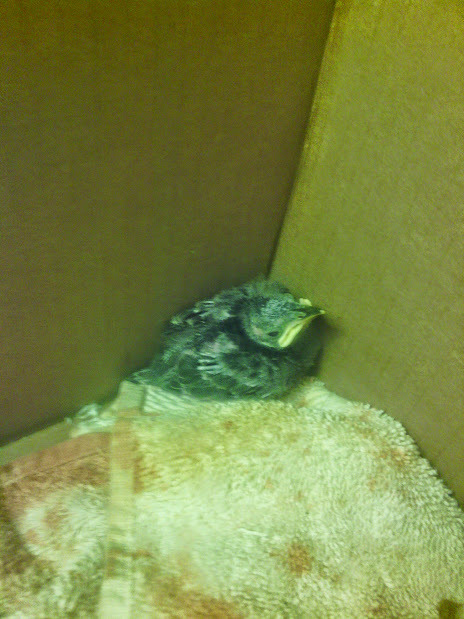 My boss found this baby bird in the eaves of the house. On the farm, there are billions of cats, and they all like to prey on poor defenseless animals. My boss gave me the bird to take care of; I am sure you can imagine my excitement! My baby was so sweet. When I held it, it would fall asleep in my hands. It is a starling, and I named it Rue from the Hunger Games. I thought it was fitting, because she sang like a bird, and was so bird-like. I was feeding my baby wet cat food, because apparently that is the best thing for little baby birds. Yesterday, I went to the farmer’s market, and I put my boss in charge of feeding it. (You are supposed to feed baby birds every hour or so, because they are so little and need the nutrients.) Well, when I got back to market, Rue was gone. I was looking all in her cage, and she just wasn’t there. I started to freak, and when I found my boss in the orchard, he just said a cat got it. He had gone up to feed her, and he had found little Rue all munched up. I was so sad. I cried for about an hour. When I went back to my room, I found its little baby feathers all over the floor. They are so tiny. I have kept every one of them. I am having a funeral too, for my baby. Poor, dear Rue! This Post was tagged Baby, Baby bird, Bird, California, Cats, Death, Evil Cats, Funeral, Hunger Games, Internship, Killing, Life, Mean Cats, Nature, Rescued, Rue, Sad. Bookmark the permalink.